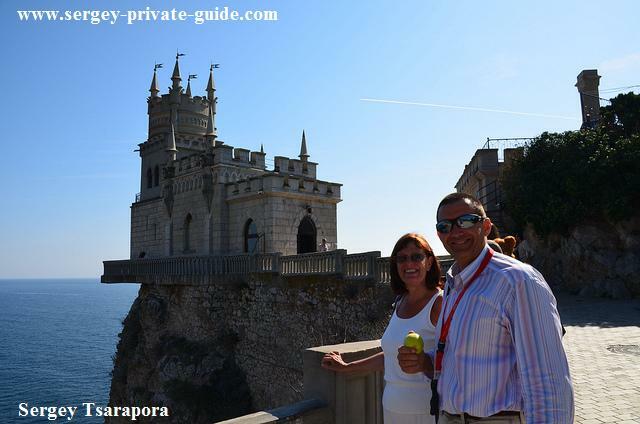 One cannot thoroughly know Yalta, if he is not in the company of the private guide Sergey Tsarapora. As soon as I reached the entrance door in the port of Yalta, after leaving the ship, I met Sergey, with his dark glasses, and I introduced myself as beeing the ¨first time I meet a Russian with the title of SIR¨. In fact Sergey Tsarapora, proved to be very friendly, and kind, and most of all, an excellent driver. As soon as we left the port he went throught the city, showing us all and explaining the way of life here. He took us, my wife and I, to Swallow´s Nest, Livadia, and the castle (my memory is weak and I forget the name by the moment) anyway, I got to know one of the most intriguing episodes of the 2nd World War, the Yalta Conference. Private guide Sergey Tsarapora told the story with such perfection that I felt that the happening had been the week before! He knows the story and Sergey knows what he is talking about. The hours we spent with him were fantastic and we enjoyed every minute of it. I hope he comes to Brasil one day and than I will try and mach him! The immemorial land of the Crimea, with its mysteries and beauties, described in numerous legends, attracted people from olden times. The Russian writer and diplomat Griboyedov once called the peninsula a marvelous treasury, a natural storehouse keeping the secrets of millenia. Its long and stirring record contains many names and events associated with the history of many nations. "Everyone who visited the Crimea at least once, departs with it with a feeling of slight sorrow bringing recollections of the childhood and giving a hope to visit this "midday land" once again," wrote Russian and Soviet writer Konstantin Paustovsky. Everything is exciting and mysterious in this land so generously endowed by nature: picturesque sea- scapes, whimsical shapes of mountain peaks, spurs and rocky conglomerations, the greenery of unique local plants of almost 3,000 species. The Crimea is not only a resort area. The peninsula is a crossroad of cultures, civilizations, nations, religions reflecting the history, both old and modern. Millions of people who come here annually show a great interest in numerous monuments of history, literature, archeology and architecture. Various excursions and guided tours help them to leam the past and the present of this land. The abundance of natural wonders produce an unforgettable impression: the Kara-Dag, the Crimea's stone miracle; romantic bays of Novy Svet and Sudak; whimsical conglomerations of Demerdzhi Mountain; the magnificent Grand Canyon; underground palaces of the Marble and Red Caves; plateaus of the Chatyr-Dag Mountains. One cannot help admiring the mountain waterfalls Uchan-Su and Dzhur-Dzhur with their limpid spurts. Bakhchisarai with its environs is rightly referred to as a treasure-house of medieval history: it boasts of majestic ruins of ancient cave towns of Eski-Kermen and Chufut-Kale. This natural-historic complex is crowned by Mangup, the former capital of the famous Christian-Orthodox Feodoro principality. "The Golden Belt" of Kerch is famous for its world-renowned Royal Barrow and the Demeter Crypt. Chersonesus, one of the most ancient cities in the Northern Black Sea Maritime region, is a veritable of antiquities. It existed from the 5th century B. C. to the 15th century A. D. Many monuments, some of them quite unique, have been discovered there. Many landmarks in the Crimea are associated with the names of famous writers, composers, artists and military commanders, such as Alexander Suvorov, Michael Kutuzov, Alexander Pushkin, Alexander Griboyedov, Adam Mickiewicz, Anton Chekhov, Leo Tolstoy, Lesya Ukrainka, Michael Kotsyubinsky, Maxim Gorky, Stephan Rudansky, Bohdanovych, Alexander Grin, Anna Akhmatova, Marina Tsvetayeva, Ismail Gasprinsky, Ibragimov, Selvinsky, Spendiarov and Vargdes Surenyants. Numerous tourists visit Pushkin's house in Gurzuf, the Chekhov Memorial Museum in Yalta, the former estate of Countess Panina in Gaspra where Leo Tolstoy once lived. Alushta boasts a memorial house of writer Sergeyev-Tsensky. Popular among the visitors are the museums of Lesya Ukrainka and Stephan Rudansky in Yalta and of Michael Kotsyubinsky in Simeiz. Enchanting Koktebel vistas inspired poet and artist Maximilian Voloshin. Feodosia and Stary Krym keep the memory of Alexander Grin, famous romantic writer who spent his last years there. The Aivazovsky Art Gallery in Feodosia posseses a vast collection of the great sea-scape painter who bequeathed his works to his native city. Among the numerous monuments of architecture and history we should mention the Count Vorontsov's Palace in Alupka; Livadia Palace of Nicholas II, Yusupov's Palace in Koreiz, Tsar Alexander the Third's palace in Massandra, and many other imposing buildings constructed to the designs of famous architects N. Krasnov, F. Elson, K. Eshliman, N.Tarasov, M. Mesmakher. The Swallow's Nest castle built after the design by architect A. Sherwood in 1912 is considered to be an emblem of the Crimea. Excursionists to Kuchuk-Koi can admire a sculptural complex by A. Matveyev (in Parkovoye village). Numerous Yalta visitors invariably pay attention to the bell-tower of St. John Chrysostom's Church. This architectural monument was built after the design by Gelogiy Torichelli. The former Armenian Church built in 1917 in the style of early Christian churches of the 7th - 12th cc. is striking for its beauty. The Roman Catholic Church, one of Yalta's architectural landmarks (presently, the House of Organ Music) was built in neo-Gothic style after the design of N. Krasnov, Academician of Architecture, in the early 20th century. The Foros Church, a masterpiece of Crimean architecture, is nested on the cliff soaring in the blue transparent sky. This small graceful structure was built in Byzantine style after the design of Academician N. Chagin. One of Yalta's most picturesque corners at the foot of Stavrikai Rock was named the Glade of Tales. Numerous fairy-tale heroes carved of wood by professional and amateur artists live in this original open-air museum. The Nikita Botanical Garden, a green gem of the peninsula, produces an unforgettable impression all through the year. Its fantastically rich collection numbers thousands of flora specimens from all the continents. The Crimea is a recognized tourist centre with long-standing traditions. 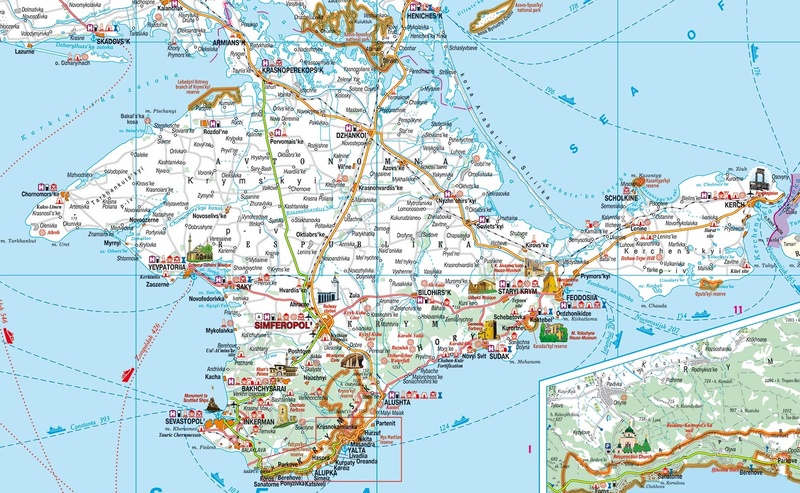 Over 100 routes throughout the peninsula invite tourists to get acquaintance with Crimean landmarks.